As I stood at the carousel at my destination airport, waiting as patiently as I could for my luggage to arrive, it was clear to me that I didn’t have this fully figured out. Having focused on international travel and local commuting over the past few years, I was accustomed to a wheeled portfolio computer case as my primary tool for toting my stuff. Samsonite makes a pretty good line of affordable cases in a myriad of configurations, like this one. I refreshed my wheeled computer case with a model that could fit my laptop, all accessories, Bose QC-15 headphones, a myriad of files and notebooks, some office supplies and more. It was perfect for the commuter train, and gave me access to everything I needed when flying overseas. I still use it when I travel that way, and it’s perfect for me – no strains of over-the-shoulder carrying, while nimble and roomy. However, It had been a while since I had to travel regularly on short trips (i.e., 1-2 nights), where getting in and out of the airport quickly becomes a necessary part of your travel strategy. Anyway, back to the carousel. My failure was compounded by not just the wheeled portfolio case, but a real folly in luggage concepts: the carry-on wheeled garment bag. It seems like a great idea. You can pack a couple of suits, minimizing wrinkles by the half-fold configuration, and it fits in a carry-on size. Awesome? Not awesome. The first problem is that it doesn’t fit down the aisle on an airplane, unless of course you’re in business class. Wrestling with these two things was also a pain. And, I was surprised to learn that the wheeled portfolio case and the wheeled garment back actually don’t meet the carry-on standards – the portfolio case is actually too big for continental flights when you have another carry-on. I was in disbelief when the check-in agent scornfully declared I had to check one of my bags – I actually went over to the measuring cages to check for myself. Busted. The carry-on wheeled garment bag was sold on Kijiji the following weekend. And, the research began on how to do this properly. There are a tonne of travel blogs out there, with advice on every aspect of travel. Frequent business travellers, and the best of them, will advocate for having a single piece of carry-on luggage. The leading wisdom advocates for a simple two-wheeled carry-on, and some time-tested techniques for folding your suit properly (I recommend the inside-out arm technique, folded with paper and plastic from your dry cleaners). 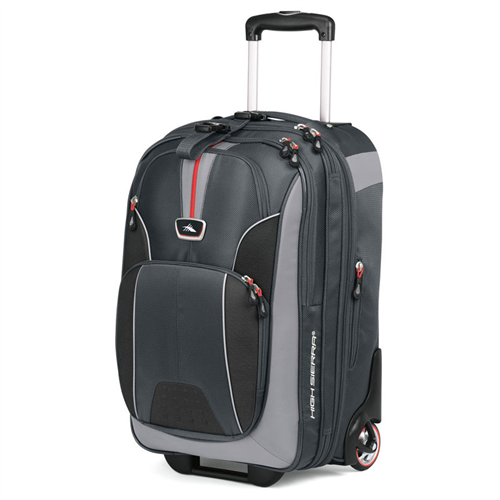 Getting to a single-carry on means getting rid of that laptop bag – I was inspired by this blog, which recommends a lot of products from Eagle Creek including the Tarmac 22 carry-on luggage. You should check it out. The High Sierra AT6 Carry-On Upright with Computer compartment was my choice. These guys make a few different models, but only one with an interior compartment for a laptop (I would not recommend their model with a detachable backpack, that’s not a great idea for reasons I won’t get into). The laptop compartment is big enough for any laptop, likely up to 17″. I have my MacBook Air 13-inch and the space is perfect for my Tumi Laptop carrying case that provides some protection, and allows me to carry the computer and some accessories into the office separately (see Part 2 of this blog entry). The exterior pockets are also sensibly sized, with an upper and a lower exterior compartment. The lower compartment easily fits a toiletry bag, which I like to keep separate from the clothes; and, the upper compartment is perfect for any random cables or accessories I carry. The laptop compartment is between these exterior compartments and the main compartment for clothing, but it is easily accessible with its own separate exterior zipper. This is actually a good design because it does not keep your laptop on the exterior of the luggage where it might be subject to being bumped around. There is a zipper lining between the laptop and main compartment, in case you don’t need to separate the two sections and need more space. The two wheel design is also optimal for interior space. For some reason, spinner wheel bags are growing in popularity, which reduces interior space and also makes it difficult to dart at top speed through the airport terminal or public transit system. Who are these people leisurely pushing their spinner bags around? What life of leisure do they have? Speaking of wheels, the two wheels are protected around the sides, along with the back/bottom of the luggage, but some plastic materials that protects from the inevitable bumping and knocking your luggage will take. The front bottom of the luggage has a foot that doubles as a handle so it’s easy to grab the luggage lengthwise. The only lame part of this carry-on it the mesh bottle carrier that extends from a zippered side-compartment – it flops around too much, and carrying bottled water through the airport is not worth the effort with the security check restrictions. Back to basics… less is more. The bottom-line: Highly recommend the High Sierra AT6 wheeled carry-on with computer compartment for the business travel who likes to travel light and strives for the one-piece of carry-on luggage, but be sure to get an laptop case that fits inside the compartment. ← BBQ Lighters – Yes, really.